With almost all people having access to the Internet, your hotel will gain an international exposure with your own official website. A hotel website is the central hub of all your internet marketing activity. It must be focused on maximizing the conversion of visitors into bookings and be as visible as possible to search engines. How the site is designed, structured, written and built all have a major impact on the conversion rate and search engine optimization. 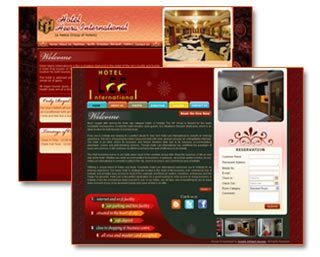 All of our hotel website designs are developed to optimize the conversion rate and SEO. A hotel business, being a service business must mention high level of customer contact. This is basically due to the fact that services are not measurable nor are they tangible. Hotel businesses aiming at hosting clients from away land must find a way of informing them right from wherever they are coming from of the existence of this hotel as well as direct the way on how to get to the premises. A hotel website would contain all the data that would describe the hotel in detail. The following benefits therefore mark the reasons why a hotel should never luck a website. Publicizing a hotel business through electronic media can be very expensive. On the other hand, it may not be comprehensive as to cover all the details a client may require. Similarly, one may fail to catch the advert once it is done. With a website, it holds all the information ready for use 24hours a day and 7 days a week. This makes the information relevant and available to the client and to his or her convenience. A website offers the clients with brochures and forms that are ready for download and others that are electronic which makes it a lot more easier for the client top book online. This defiantly increases the bookings and subsequently the profits realized by the hotel. The use of visa cards to effect online payments makes it possible for a client to complete the booking even from a different country. A nice looking website that offers an attractive image of the hotel and its surrounding captures the attention of the client. The hotel management must ensure that the website displays how they really are and even more. The services provided at the hotel are included in the website. This may include services that are too many to be described in an electronic media spot. The website therefore summarizes the whole hotel business for the convenience of the client. Special emphasis can are put on the firms competitive edge so as to be clear to the client. A website also provides the client with answers to the frequently asked questions hence saving time and money on staff to attend the queries. This is vital information to the management in forecasting the business trends and indentifying the boom and recession period so as to plan efficiently. Data the is collected from these trends is raw and therefore makes it easy for analysis to be conducted accordingly. Any new event is placed on the hotels website and its details are well provided for. This supplements the electronic advertising and print media in that the hotel will advice them to visit the website for more information after making a short spot on T.V. or radio. A change in the progress of the hotel that the client and general public ought to know is also placed in the website for the interested parties to view. with a website fully loaded with text information about the hotel and its services as well as photographs of the establishment, people can get to learn more by themselves about your business. As such, your operating costs would decrease since the need to hire employees and sending them out to various areas to promote your hotel is eliminated.